Dirty Challenger is a poorly done game. The graphics are below average and there's only six wrestlers. 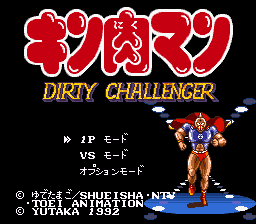 The wrestlers in Dirty Challenger are based on M.U.S.C.L.E. men: action figures from the 80s which were popular in Japan and later America. Although the guys in the game actually look very good when compared to the figures, they just don't look good enough. The moves are pretty bad and completely unrealistic, especially the finishers, atlthough there are a few very good moves mixed in with the all the incredibly bad ones. The mandible claw and the pedigree are two good examples. Also there are electrified barbed wire matches and street fights, but they are poorly done, so don't get too excited. Bottom Line: The only good thing about this game is that there are a few original moves in it. This game gets boring fast.